All transactions are safe and secure with a reliable history in online purchasing behind each of our associates. 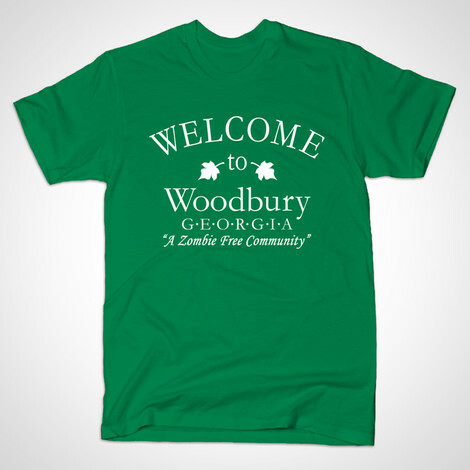 Buy the Welcome to Woodbury t-shirt to own Walking Dead clothing and merchandise. When the world has gone through a zombie apocalypse, who can you trust? Sure, a sheriff from the former life might fit the bill, or even Daryl Dixon and his trusty crossbow. However, the "lucky" ones have taken refuge in the walled town of Woodbury. Little do they realize the town's leader, who the people call the Governor, is a sadistic tyrant who ruthlessly kills both zombies and humans. Instead of a Rick Grimes t-shirt, consider one of these Welcome to Woodbury Walking Dead tees, which will let others know that you have been to the zombie free community. In addition to the Welcome to Woodbury tee above, browse the Walking Dead Clothing Gallery for more apparel like men's and women's clothes, kids shirts or hoodies.